IIABA National Young Agents Committee Chair Joey O’Connor (left) and 2008-2009 IIABA Chairman Brett Nilsson (second from right) congratulate members of the Young Agents Council of the Michigan Association of Insurance Agents: (beginning second from left) Ashley Whitney, Karl Leuter, Holly Rossell and Patrick Radewahn. 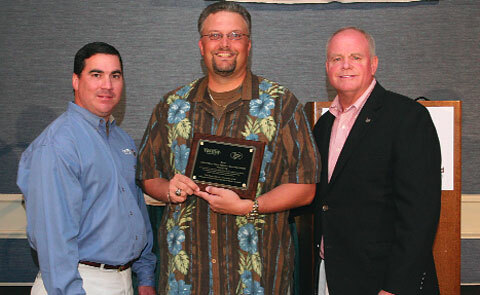 Representing the Young Agents Committee of the Independent Insurance Agents of North Carolina, Chris Meinberg (center) accepts the award from Joey O’Connor (left) and Brett Nilsson. 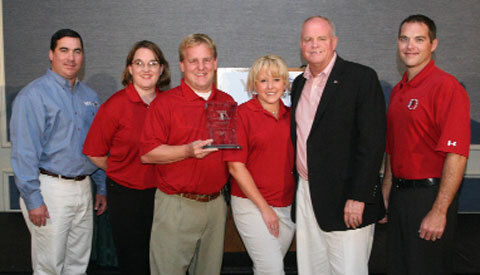 This first annual award was given in honor of Dan Fulwider, staff liaison for the Iowa Young Agents, who died of cancer in 2008. 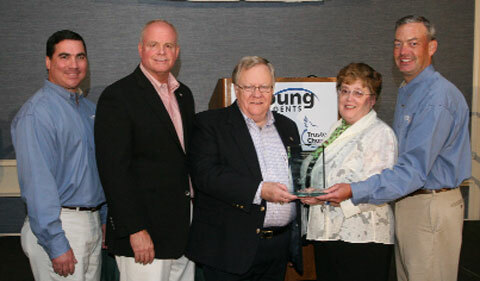 From left, Joey O’Connor, Brett Nilsson and (far right) incoming IIABA National Young Agents Committee Chair Andy Beauchamp present the award to Bob Fulwider (third from left) and his wife, Jan. It is critical for our elected officials in Congress to hear the voices of independent insurance agents on hot-button issues like health care reform and financial regulation. During the Big “I” Legislative Conference & Convention (LC&C) in Washington, D.C., March 3-5, 2010, agents and brokers will demonstrate the strength of our industry as we participate in the legislative process. I’ve visited Indiana legislators for a number of years and have found them to be receptive about what we have to say. While our industry continues to be under scrutiny, it’s more important than ever to have a strong showing of young agents on Capitol Hill. Though lobbying on the Hill is the primary reason for attending the LC&C, the Big “I” National Young Agents Committee also sees the need to help fuel the future of the industry. For the first time ever, we will be hosting “YAC Gives Back: A Benefit for InVEST Scholarships” on March 4 from 8:30-11:30 p.m. With 60% of the current independent agent pool over the age of 45 and seeking retirement over the next 15 years, we need to prepare for record-breaking workforce turnover. InVEST is vital to industry perpetuation and educates students on insurance and the breadth of career opportunities in our industry. Because there is a natural connection between young agents and new recruits, we are excited to help raise scholarship funds for this important cause. Attendees at the benefit will enjoy casino games, music, and live and silent auctions, as well as the camaraderie of fellow agents. Please visit www.independentagent.com/events for a complete schedule of LC&C events. First-time attendees can apply for National YAC scholarships to help offset some of the costs. They can also compete to win the $1,000 Maurice Herndon Scholarship. For more information, contact the Big “I” at youngagent@iiaba.net.